You guys! I am here to tell you about my friend Ivy’s new ebook coming out. It’s called Clean Cuisine Dinners – A Full Month of Delicious Doable Dinners and Weekly Shopping Lists. If you are not familiar with Ivy and Clean Cuisine, I urge you to check out her awesome website as well. Ivy was diagnosed with MS in her 20s and is keeping herself healthy with real food. You can read her story here. If you are new to clean eating or a whole food life in general, I highly recommend this book. It’s got everything you need to get started. In the book, Ivy plans out a month of healthy meals + shopping lists, so all you have to do is prepare the food. She has most of the work for you! There is a section on frequently asked questions, clean eating defined, and the recipes are clearly marked on whether they are vegan, vegetarian or gluten free. Not all the recipes are vegan, but they can definitely be altered to be that way. For more info, or to purchase, click here. The Soba and Zucchini Noodle Bowl I am sharing is totally vegan and it was one of the most delicious meals I have had in awhile. In fact, Marcus ate almost the entire thing in one sitting! I had to immediately make a second batch. It was that good! If you like zucchini pasta, you may also like this and this. A few of the other meals I am looking forward to making are the Bean and Chipotle Chili and the Roasted Veggies with Creamy Lime Hemp Dressing. The original recipe called for roasting the tomatoes, (which I am sure makes this even more delicious), but I was pressed for time, so I skipped that step. I will write the directions from the book if you care to make it the way it was written. Ivy also has another book that I would highly recommend to anyone fighting inflammation. It’s called Clean Cuisine: An 8 Week Anti-Inflammatory Diet that Will Change the Way You Look, Age and Feel. Check it out here. Place all the ingredients in a food processor and process until chunky. Place the tomatoes on a lined baking sheet . Drizzle with a little oil and sprinkle with sea salt. Roast in the oven for about 35 to 45 minutes. Remove and let cool. Bring a large pot of water to a boil. Add the soba noodles and cook for about 7 minutes. Remove the soba noodles from the water. Add the zucchini noodles to the water and cook for only 1 minute. Drain the zucchini noodles. Run both the zucchini noodles and soba noodles under cold water, separating the soba noodles with your fingers if they are sticking. 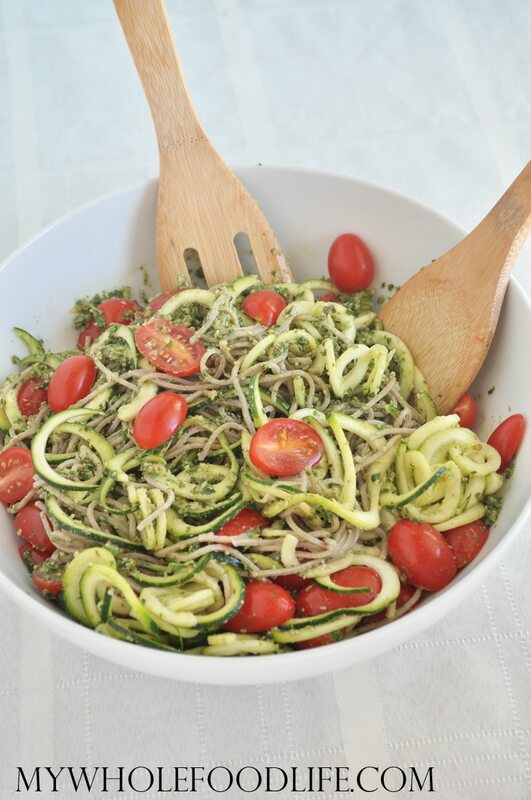 Add the zucchini noodles and soba noodles back to the pot and toss with the pesto and roasted tomatoes. Best when served immediately. This should last in the fridge for 4 to 5 days. Enjoy! Disclaimer: Post contains affiliate links, but the opinions are my very own. The end. Thanks for letting me know! I am supposed to be opted out of processed foods and meat ads. I will let my ad network know. I just got a handheld spiralizer - this is going to be made real soon!!! !